Skylar Astin, Heléne Yorke, Chris Lowell, Callie Hernandez, Nia Vardalos, Ernie Hudson, Roger Bart, and Angélica Maria also star. 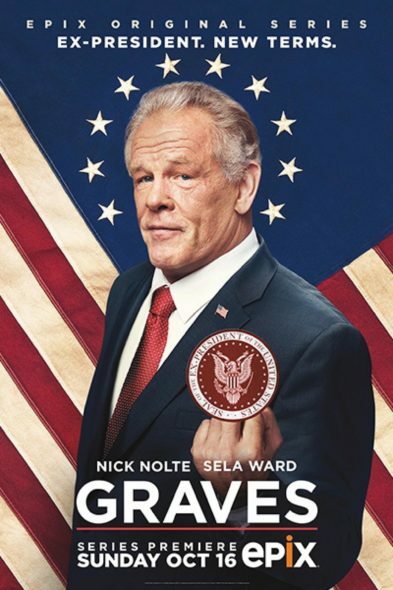 The first season of Graves kicked off on October 16th. According to Deadline, the renewal is for a 10-episode second season. Epix has not posted the news to its press site, but the cabler has also reportedly renewed its other scripted series — Berlin Station — for season two. The Graves season one finale airs on Sunday, December 18. What do you think? Have you been watching the first season of Graves? Will you tune in for season two on Epix? Was Epix right to renew it? Let us know, below. More about: EPIX TV shows: canceled or renewed?, Graves, Graves: canceled or renewed? Graves: Is the EPIX TV Show Cancelled or Renewed for Season Three? Absolutely love this show. It’s brilliant and funny. It is somewhat in reality and informative. Issues related to todays hidden government and criminal agendas. Wonderful show. I just love it.